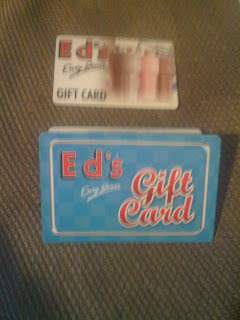 I won a meal for 2 at the new Cheshire Oaks 'Ed's Easy Diner' from @eds_easy_diner on Twitter on 25th July 2012. I received it on 28th July 2012 in the form of a £25 gift card. I live in Liverpool, so I'm not that near Cheshire Oaks, but it's only a train ride away! We sometimes go bowling at the Ten Pin and then to Vue cinema with our 9 year old son, David and my 10 year old sister, Latisha and that's in Cheshire Oaks anyway and we're planning on going again soon, so the £25 will go towards all of our meals - our first time at an Ed's Diner as well - sounds fun. The food sounds delightful - have a look at the menu http://www.edseasydiner.com/ and see for yourself. They've even got veggie options for Paul (hubby). I'm gonna struggle to choose between the Smokey Joe's burger, the Slick dog and the chicken classic! I'm also torn between sweet potato fries and the atomic American fries! Can't wait to try out their food though!